You never forget your first love. 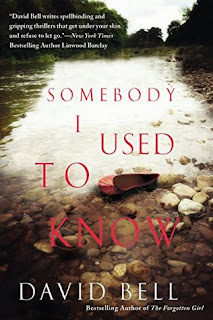 And in David Bell’s SOMEBODY I USED TO KNOW, Nick Hansen has never really gotten over the death of his college girlfriend, Marissa Minor, some twenty years earlier. He managed to move on, but Marissa’s death in a house fire right before college graduation still haunts him. One day at the grocery store, Nick receives the shock of his life: he comes face-to-face with a young woman who is the spitting image of Marissa. But when Nick tries to speak to the woman, she drops her basket of groceries and runs out of the store. Unfortunately, the next morning, the police come knocking on Nick’s door. The young woman from the grocery store was found murdered in a hotel and the only clue they have is a slip of paper with Nick’s name and address, which Nick knows nothing about. Convinced that there's a connection between this young woman's murder and Marissa's death years ago, Nick enlists the help of his college friend, Laurel Davidson, to investigate the events leading up to the night of Marissa's death. Nick needs to clear his name and uncover what really happened to the love of his life. Two decades of deceit, heartbreak, and longing will be swept away, and the truth will be more shocking than he ever could have imagined. When I was offered this one for review, I took a peek at some of the early reviews -- and I was sold on this one! Many readers said they couldn't go to sleep before finishing this one, it was such a pager-turner. I figured it was a perfect read for a get-away from my normal reads and try something a little different. I am so glad I did! I did read this in one day-- 448 pages all day on a Sunday, despite the spacing issues the eGalley version showed. Somebody I Used To Know was definitely a thrilling suspense story that kept me guessing. It centers around Nick and the girlfriend he lost twenty years ago due to a house fire. I won't go into the summary of the story as the synopsis does it nicely enough - plus with suspense and mysteries I don't want to give too much away! There were a lot of characters where that started to get a little much but once everything was set in place there was no turning back. There were a few themes at work in the novel, from small romantic tones to vengeful evil lurking in every corner where you least expect it. I didn't stop too long to think about solving the mystery on my own due to the many moving parts; I just kept turning the pages and let the story play itself out. Nick was a great character, seemingly a a goody-two shoes with all sorts of bad things that just keep happening to him especially with deceitful characters who kept intersecting his path. There were a few female lead characters to spice things up and throw suspicion about, and of course the crime stopping police detective mucking things up when Nick was just getting some answers. The writing style was perfectly fluid, never giving me a good chance for a stopping point which is why I never did. Very well done, and I will read more from David Bell when I need a swift thrill to get me out of a reading funk. I definitely would love to see this as a movie. Just leave a comment on this post with an email address so that I many contact you if you win. Email Subscribers, please forward the email of the post to reviewer(at)burtonbookreview.com and you will receive 2 extra entries. Open to USA addressees only.